We are excited to have Christina Docter back this summer as our Lead Summer Director. All summer camps are 9am-3pm, Monday through Friday. The two week camps will have performances the last Friday of camp and on the following Saturday. 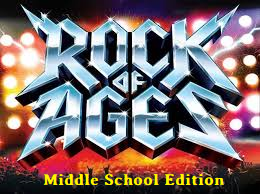 A boy-meets-girl classic musical story set to an exciting and fun 80s rock soundtrack. What could be better? Set on L.A.’s famous Sunset Strip in 1987, Rock of Ages tells the story of Drew, a city boy from South Detroit, and Sherrie, a small-town girl, who have both travelled to L.A. to chase their dreams of making it big and falling in love. This classic love story is set against the troubles at the Dupree Room, a “legendary temple of rock ‘n’ roll excellence”, under threat by developers of being torn down and replaced with a strip mall. The threats of closure bring legendary rocker Stacee Jaxx to town, and an opportunity for Drew to chase his dream to rock out with the best. Trouble brews as Drew abandons Sherrie for his dream of stardom, rock ‘n’ roll bad-boy Stacee lures Sherrie away, and the Dupree Room is surrendered to developers. Can Drew and Sherrie rescue their love, and can the Dupree Room be saved, before it’s too late? *For this camp only, rehearsals are Tuesday May 28th-Saturday June 1 and Monday May 3rd-Friday May 7th (because of the Memorial Day holiday). One of our favorite weeks of the year! Show choir is a combination of singing and dancing with an ensemble of connected artists. This years theme to our set is “Sunshine”, all songs will be about, or in pursuit of what we miss so much in the winter time, THE SUN. There will be opportunities for solos, both dance and vocal! Calling all superheroes! The citizens of Nova City need a patron superhero to save them from the evil clutches of the nefarious Colonel Mustard and his sidekick Hemlock. So what do they do? They hold an audition, of course! Legions of fantastic, incredible, and uncanny characters descend upon City Hall hoping the mayor and police commissioner might marvel at their strange powers, which range from super strength to super speed, from mind reading to animal whispering, from quoting Shakespeare to pointing out irony. Okay, so some superpowers are more helpful than others, but when Colonel Mustard unleashes a surprise attack on City Hall, both the mighty and the average must join together to bring justice and security to Nova City. 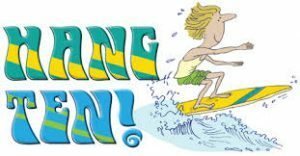 Surfing songs in the style of the famous Beach Boys, the Ventures, and other beach music bands give this one-act musical comedy endless energy and fun. An Italian immigrant’s Surfin’ Burger restaurant sits on one of California’s best beachfronts. But his dream of owning a restaurant in America is about to be shattered. Not only are his granddaughters becoming too American for Luigi’s tastes, but scheming land developers try to steal his property to build a huge hotel on it. Filled with both hijinks and heart, audiences will cheer as Luigi is able to thwart the developers thanks to the help of his daughter, granddaughters, their surfer friends, and a bird-watching society. Get the opportunity to stage manage one of our MainStage productions by taking YAAL’s ONCE A YEAR stage management class. Join the “other” side and come learn professional stage management techniques, how to design and operate YAAL’s sound system, how to design and operate lighting a stage, learn to sit with a director and take blocking and notes and SO MUCH MORE! It’s Spring of 1999, we Join Kat, Gwen, Larry, Samuel and many of their actor/singer/dancer friends, as they audition for the biggest workshop in New York’s West End. Follow them and the biggest day of their careers, as we watch them give everything they’ve got to land a role in “that show”. With singing, dancing, and as always, knee-slapping comedy, come and create a show from scratch with Christina Docter and many of your favorite YAAL friends, as we use ABBA’s Greatest Hits as a backtrack to our hilarious musical. At the Lava Springs Country Club, popular girl, Sharpay, reigns supreme while the Wildcats get to work – literally! Featuring every ounce of the light-hearted fun that made “High School Musical” a household name, this buoyant sequel follows our East High favorites as they face the realities of the adult world and begin to grow up. Friendships are tested, summer romances go haywire and the meaning of success is redefined. Rockin’ songs, action-packed dance numbers and ample opportunities to highlight a strong ensemble make this an ideal show for young actors. Jump into the pool with the Wildcats as you swim along with this crowd-pleasing, fun-filled charmer! Come one! Come all! Step right up! Watch the greatest stories on Earth come alive under the big top! It’s a circus full of laughter and lively storytelling as the ringmaster and players perform a variety of well-known tales such as “The Bremen Town Musicians,” “The Billy Goats Gruff,” “The Lion and the Mouse,” “Monkey See, Monkey Do” and “The Magic Fish.” Join us for this fun camp that is great for beginners and seasoned actors alike.